To be able to examine the function of individual cells or structures in intact tissue, these need to be visible. This may sound trivial, but it is not. To achieve this, researchers implant fluorescent proteins into cells. 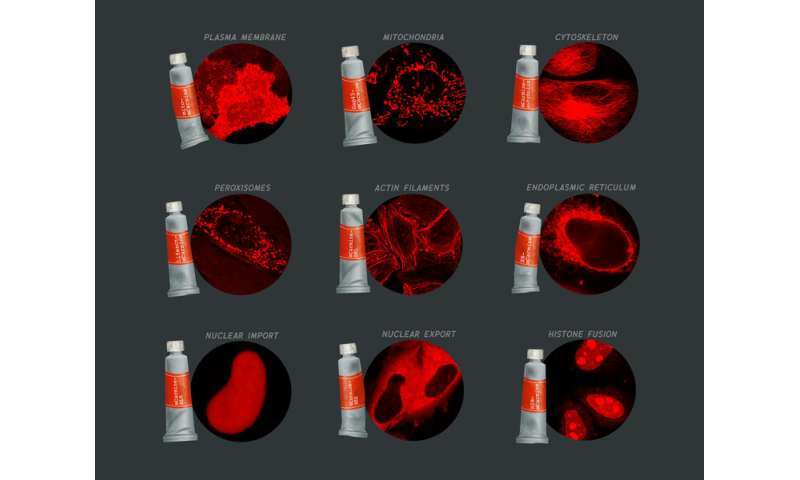 These will then produce the proteins themselves, without the cell functions being disturbed: cells, structures or their activities thus become visible under the microscope. However, the proteins need to be optimized for their use in research. The required "protein engineering", in which highly sensitive and specific proteins are developed, is a dedicated research branch. Scientists from the Max Planck Institute of Neurobiology in Martinsried have now developed a method that provides for a significant improvement of protein engineering, by means of automated computer analysis and a robot-supported selection process. This has been verified by first successes achieved with a deep red protein. The robotic arm swivels to the side with a soft humming sound. A little bit to the right, slightly forward, then it stops briefly, before a bar equipped with a little metal ball is pushed down. "There you go! It found another one." Arne Fabritius, who is monitoring the process on the screen is almost whispering. Only briefly does the metal ball touch one of countless beige spots that cover the surface of a gel-like substance in a round dish. The arm immediately pulls the ball back up, then moves on to a plate with small cavities, making a humming sound. It drops the ball into one of these cavities with a soft "ping". "This used to take forever and you never knew, if you had spotted the correct colony and if you had actually hit it." Arne Fabritius leans back smiling. "This new technology is simply fantastic!" The postdoc from Oliver Griesbeck's research group knows what he is talking about. He and his colleagues along with the staff members of the Institute's workshop, spent several months of meticulous work to develop the new method. The result: a screening platform that allows for thousands of bacteria colonies to be screened for particular properties and to be deliberately reproduced. Fabritius is looking at the screen again: "Each of these bacteria colonies carries a slightly different variety of a protein and the programme picks the best varieties based on our parameters." Because this is what it is all about – the scientists develop improved proteins for biomedical research. "And it is working really well with the new platform," says Andreas Kist, who just happens to enter the room. "They have developed a fluorescent red protein in virtually no time at all that enables us to get a much deeper insight into the brain of our zebra fish larva, than was possible with any proteins available in the past." "Well, it wasn't quite so easy," Fabritius is laughing. "But compared to the past, the platform does make developing proteins a lot faster and more efficient." The scientists have now developed the mCarmine protein, which is fluorescent in the deep red area yet still very bright. The long wave red light is gentler on the tissue, and is absorbed by it to a lesser extent than other light colours. As a result, neurons and structures deep in the brain of the transparent zebra fish larva are now visible under the microscope, much more easily. "This opens up opportunities for a range of new research projects," says Andreas Kist with obvious delight. "The new screening platform has already proven itself with the development of mCarmine," comments Oliver Griesbeck on his group's success. The researchers have published the code and the building instructions, to allow working groups around the world to recreate the working station at relatively low cost. "I can see great potential, and I hope that this will add further momentum to the field," says Griesbeck. It goes without saying that he also has a few ideas for further development himself. I bet scale comes in useful when trying to differentiate between these information-bearing patterns.